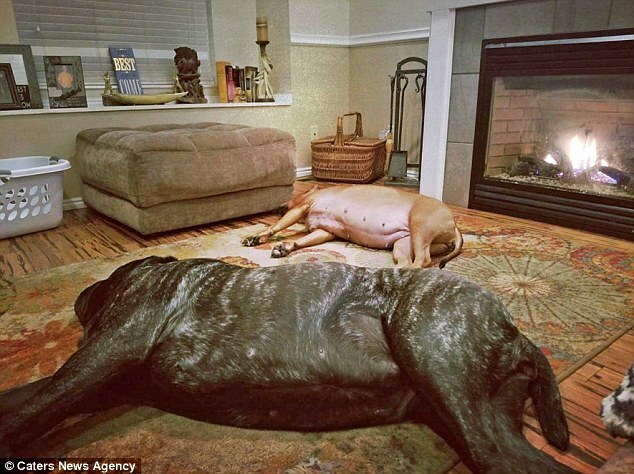 A nine-month-old dog that weighs 12 stone (180lb) and stands six-foot-tall (1.8m) may be the world’s biggest puppy. 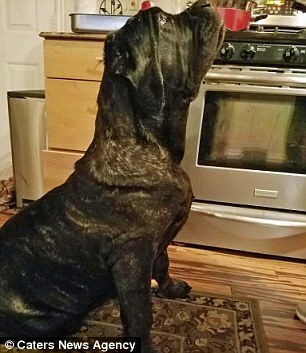 Enormous Euphrates was bred to replicate a prehistoric canine species and eats an impressive eight cups of dog food a day. 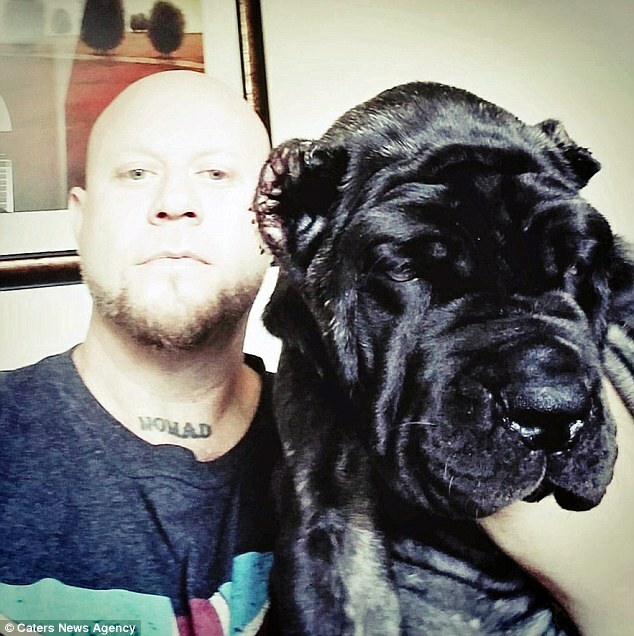 Owner Jared Howser, 41, of Salt Lake City, Utah, said onlookers often confuse his puppy for a fully-grown adult. 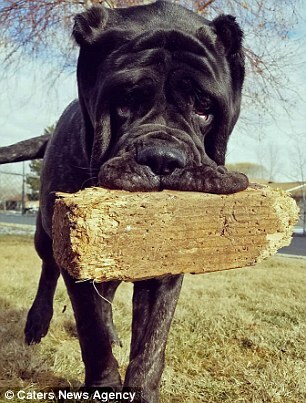 He said: ‘At nine months there simply isn’t another dog 180lbs and 31.5 inches to withers anywhere else in the world, she is an anomaly. 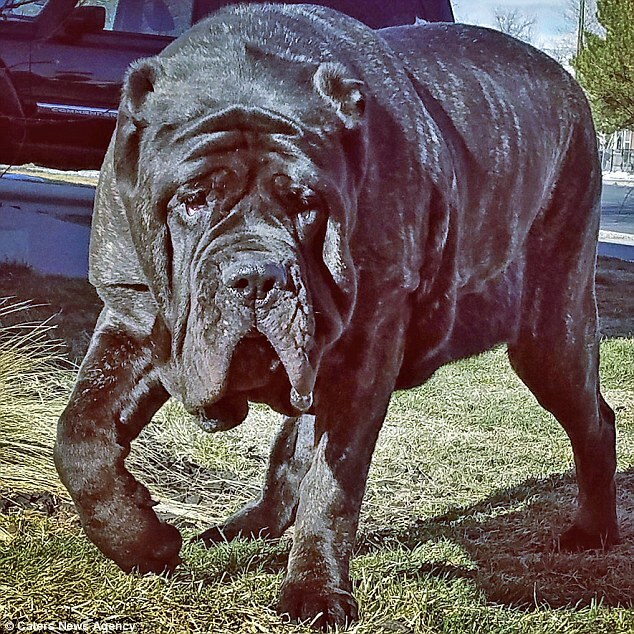 She is a member of a new breed called the American Molossus, selectively bred to be the closest genetic descendent of the Mesopotamian Molossus, a massive dog species that died out 7,000 years ago. The only remnants of the ancient canines left are in museums, with some accounts suggesting they were used in battle in ancient Mesopotamia. Because the American Molossus is still a new species, it is not known how big Euphrates will grow. 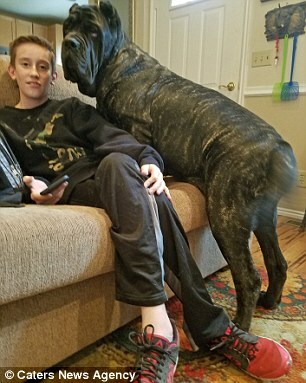 In public people often gasp upon seeing the colossal canine and can’t believe how big she is for her age, often confusing her for a fully-grown adult. 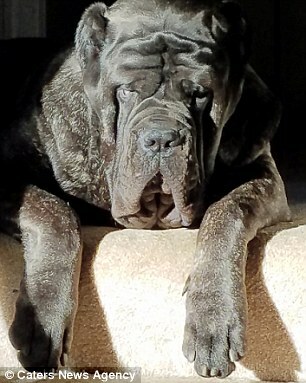 Mr Howser, a carpenter who makes kennels for large dogs, said: ‘It’s unreal and unheard of, at nine months her size and strength is far beyond what I thought it would be. ‘When she stands on her hind legs she is six-foot-tall, that’s only at nine months too, on all fours to the withers, the tops of her shoulders she is 31.5 inches [80cm]. ‘If she was to stand she is big enough to look out of the peephole on our door. WHAT IS THE MESOPOTAMIAN MOLOSSUS? 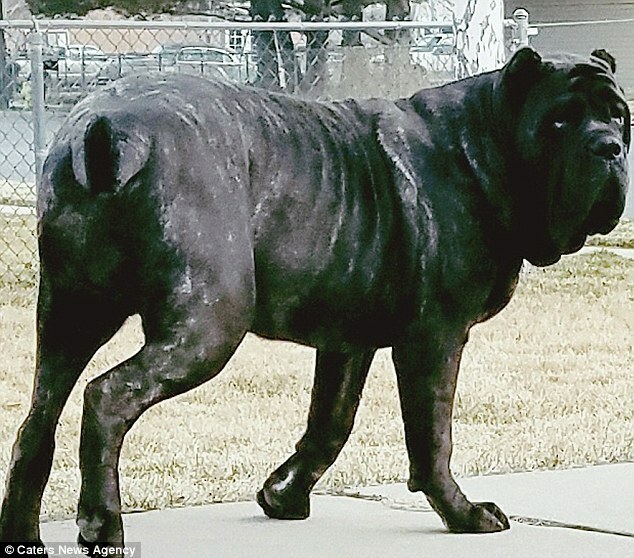 The Mesopotamian Molossus was a massive dog species that died out around 7,000 years ago. 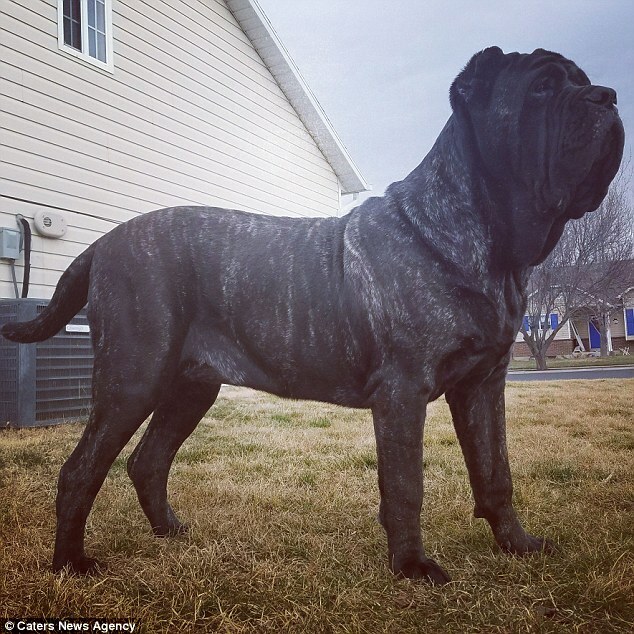 It is a member of the Molossus breed, which originated in southern Europe. The only remnants of the ancient canines left are in museums, with some accounts suggesting they were used in battle. When the Romans conquered Greece, they adopted the Molossus dogs and also used them as war dogs in the hunt and the arena. 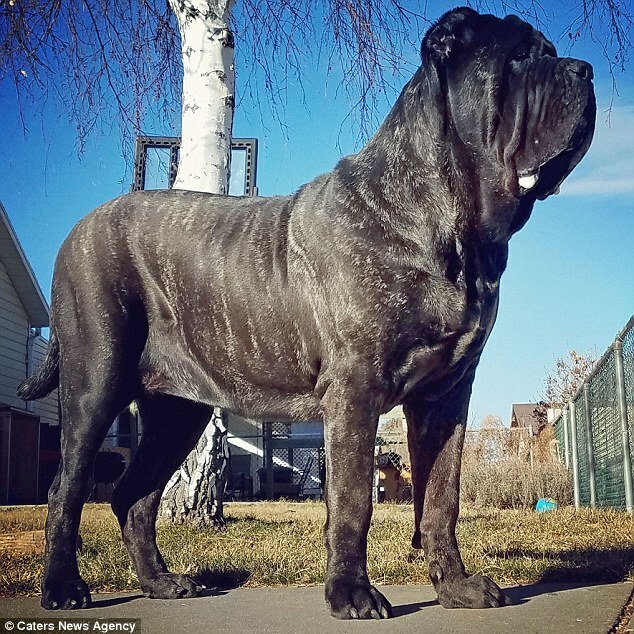 The huge breed is reported to have been used to fight alongside the Romans by having bladed and spiked leather harnesses tied to their backs and being trained to run under the bellies of enemy horses. Other scholars argue the breed was primarily a lightweight dog used for hunting and herding, with physical characteristics more akin to a pitbull. 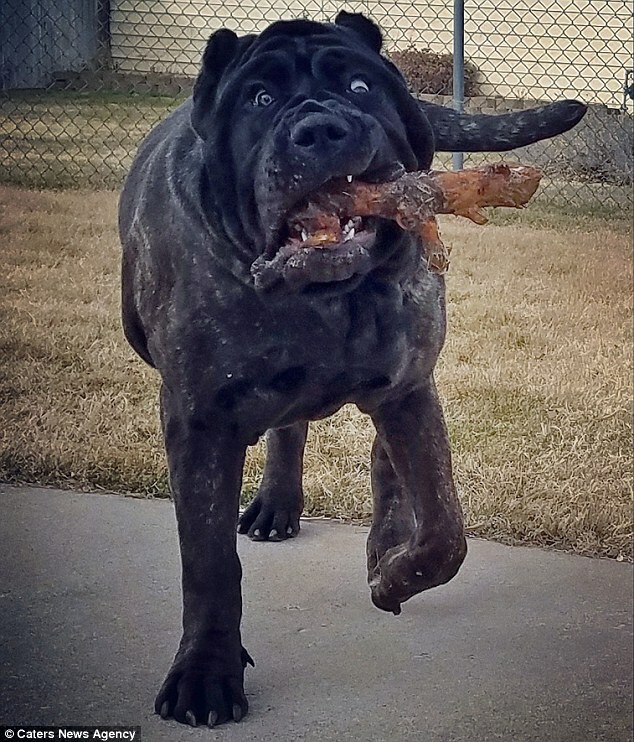 ‘I’m 260lb and 6ft 3, but if she decided to run I couldn’t hold her on the leash, she could drag me down the road with ease. ‘When people look at her, they are surprised and asked how I’ve been able to keep her under control, joking that I must be a lion tamer. 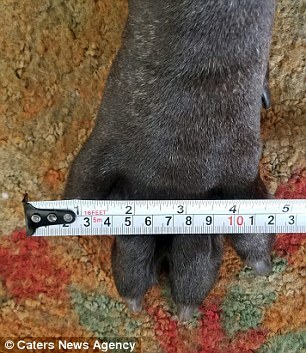 Euphrates cost £3,600 ($5,000) and was the largest of the litter, so far she has had two growth spurts that took place over a couple of weeks each time. Mr Howser said that her vast alteration in size over a short period of time left her clumsy as she was having to readjust to her size on a daily basis. 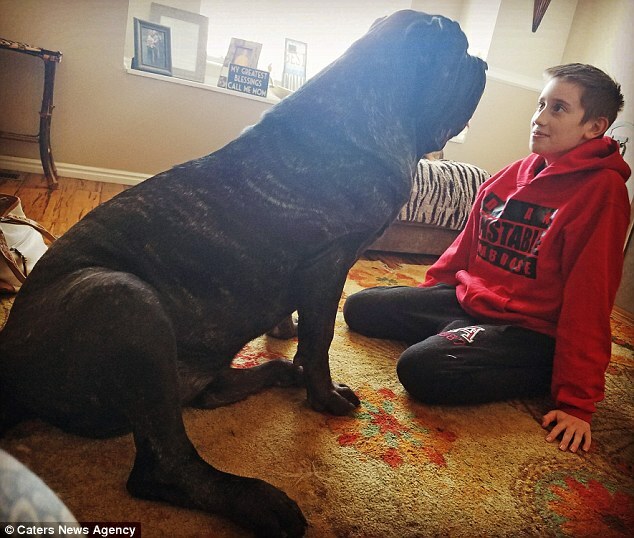 He started looking for a larger dog after witnessing a home invasion, where traumatically he watched as a burglar threw a 60-kilo (136lb) Cane Corso dog out of a window to its death. 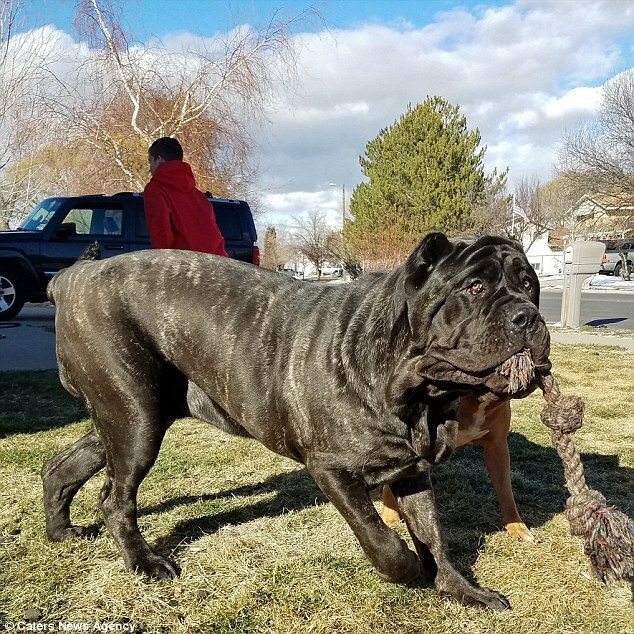 After consulting with a breeder, he was told about the American Molossus breeding programme and would go onto become one of the first to adopt one. Mr Howser said: ‘The Molossus of ancient Mesopotamia was a magnificent animal. 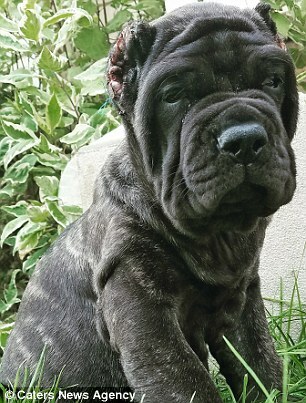 With a black brindle coat as dark as the night and a massive build, they were fierce in appearance. ‘These dogs made men tremble at their sight. With a profound sense of loyalty, these giants would defend against any man or beast that threatened the safety of their masters. ‘The only two direct lines coming from that ancient dog are the English and Neapolitan Mastiff. Despite being a natural protector and intimidatingly sized pup, in public the mountainous Molossus is very friend, gentle and caring. Mr Howser said: ‘The hope is to avoid any violence, she is a big scary dog, I live in a good area but we are the only house on our block not to have had our car broken into since having Euphrates. ‘She is very affectionate with us, when we take her out in public she is very affection with children and women especially.